175115 at Crewe on 1 November 2003, with a late night First North Western service to Holyhead. 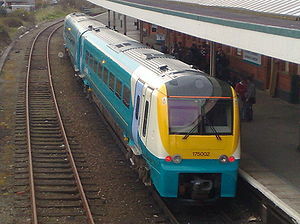 175008, at Newport, in the new standard Arriva Trains Wales livery. The Class 175 Coradia is a model of diesel multiple unit passenger train used in the United Kingdom. They were built from 1999–2001 by Alstom at Washwood Heath in Birmingham. The fleet is currently based at Chester Depot. The fleet is used in North Wales on services from Holyhead, South Wales, normally going south or up to the North Wales Coast. Many also operate round the Manchester area. This page was last changed on 19 April 2013, at 21:00.